Professional development certificate programs provide an excellent way to earn a credential, learn new skills or retool for a job change. A recent study by Georgetown University’s Center on Education and the Workforce called certificate programs a gateway to gainful employment and college degrees with over a million certificates awarded each year. “In the context of concerns about rising college costs and student loan debt, certificates, which are cheaper and take less time to complete than college degrees, have become of increasing interest to researchers, institutions, and other stakeholders in higher education,” explained the researchers, outlining the rationale for their study. “Certificates are a homegrown American invention and are expanding rapidly in response to a wide range of educational and labor market demands,” reported the researchers. A major finding of the study is that the postsecondary certificate has become a cost-effective tool for increasing educational attainment and gainful employment in the U.S. The University of Delaware’s Division of Professional and Continuing Studies offers a range of certificates in the health care, legal and business fields. These practical programs offer concentrated study in a specific area and can be completed in a relatively short time through part-time study. Last semester, 101 students earned professional development certificates through UD’s Professional and Continuing Studies. A certificate information session for Spring 2013 certificates will be held at 6 p.m., Thursday, January 17, at the Doubletree Hotel, 700 N. King St., Wilmington. 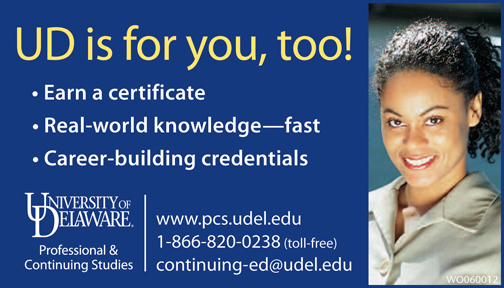 The information session is free, but reservations should be made by calling 302-831-7600 or visiting www.pcs.udel.edu/certificate/info/. Certificates featured at the information session include: Analytics–Optimizing Big Data, Business Analyst, Clinical Trials Management, Financial Planning, Lean Six Sigma Green Belt, Paralegal, Advanced Paralegal and Project Management. The information session is an ideal place for potential students to find out if a certificate would meet their needs. Attendees can meet instructors and UD staff and have the opportunity to ask questions. Graduates from several of the certificate programs will be on hand, and refreshments will be served. UD Downtown Center at 8th and King Streets in Wilmington, and are scheduled to suit people who are already working. Time required to complete these certificates ranges from four months to just over a year.